Imagine… – Are Your Planets Keeping You Fat? I’m often asked where I get my ideas from. I have another couple of blogs and a word count that needs doing each day, so it’s a fair question. It’s also a question authors have been asked for eternity. Mostly ideas come from the every day. Take yesterday for example. I was in the backyard doing some long overdue weeding. We have a large-ish suburban block and yesterday some of the weeds were so incredibly tall they would dwarf a small child. Some were approaching the size at which I’d need council approval to dig them up. Ideas come from everywhere- news stories, other blogs, songs. They also come from quotes. I’m not a big fan of the inspirational quote. I’m not a big fan of the inspirational guru, or the celebrity this that or other. Sure I post the occasional one on my Facebook wall, but most of my favourite lines come from Pet Shop Boys songs- and there isn’t a lot of inspiration gonna come anyones way from those. I do, however, get some great blog titles for the Astro blog from them. “How hard can it be?” Attributed to, well, me! “imagine…” John Lennon… Is anyone getting a theme here? “No matter how late, drunk or tired you are- take your make-up off before you go to bed” -this one’s from me again. and finally my personal favourite: “somewhere in the world it’s 5pm…” Yep, that ones from me again! And he comfort zone one! My BMF bought us matching fridge magnets with this one on it. He’s an Aries so is always pushing me out of my zone. 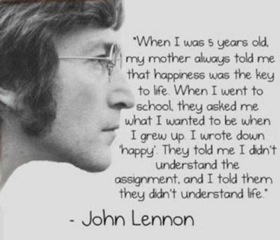 I also love the opening quote by Lennon.